I have absolutely tons of art to post seeing as it’s been over two months since my last post. I’ve been very busy creating art for work and for presents but haven’t posted any of it. I’ve also been taking a new course over at Concept Art and it’s a fun one. I’m only just starting though so will have more to post on that later. Here are some more life drawings! One of my fave things to do. These at left are from a session a couple of weeks ago, my first one in months. These are done in pen in my sketch book and it took me a few drawings to really get back into the swing of things! It’s been a while. Above (and below) are some of the value studies I’ve been doing for the new art course at Concept Art. Obviously mine need a bit of work but we’re only supposed to take an hour on each. I need more time than that! LOL. Below is my Flower Girl, part of the art-a-thon prompts (this one for flowers). The next one is encaustic which I will be steering clear of since it seems messy and I don’t have any crayons or wax paint to play with. Above are some of my recent art not posted here yet, all ACEOs available in my Etsy store. Paintings 2 – 7: Still going strong! I’m still on the 30 Paintings in 30 Days kick and am doing well so far. I even made a couple more small paintings as back-up, in case I get too busy at some point during the month (or more likely too lazy as I have a slacker’s heart). This first week has been a mix of acrylic, mixed media, watercolor and digital. I’ve also been quite partial to studies of marble statues… and faces of course. I’m just not big on still life and animals or landscapes, try as I might. For the next 7 days, I’m trying out a few style experiments to see where they take me. I love bright colors obviously and I enjoy mixed media with lots of weird papers tossed into the canvas mix so that will be my focus for the upcoming week. And antlers. Those are always good with everything. I might toss in some cigarettes too. I gave up smoking many years ago and I now smoke vicariously through my paintings…. or just breath deeply in the smoking area outside of a pub. I’ve been that person. 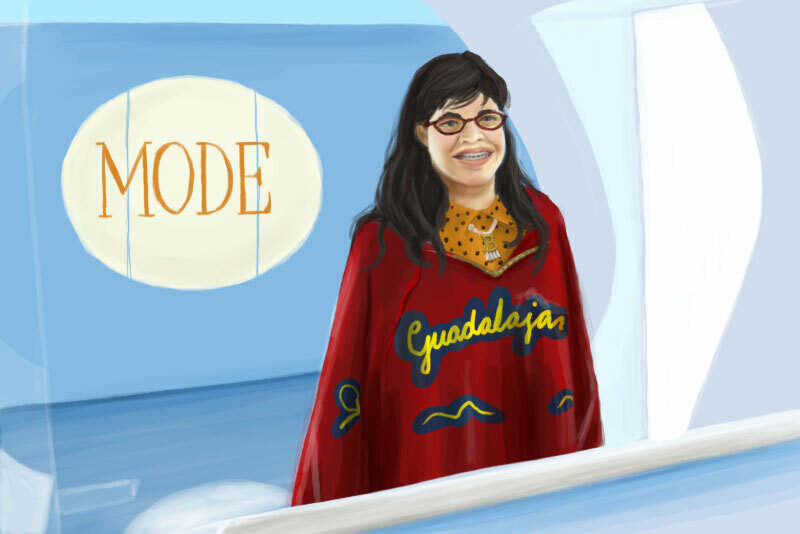 Here’s a quickie movie still from Ugly Betty. I like these for practice painting sessions. Here’s an illustration that I’m working on over the next few days, a pretty nature goddess. I’m still working out the composition and colors so things are likely to change. It’s a WIP. I still have no idea what she’s going to be holding in her hands! Flower maybe? An earth? At left is a quickie portrait from a recent life drawing session. This model is one of my favorites. 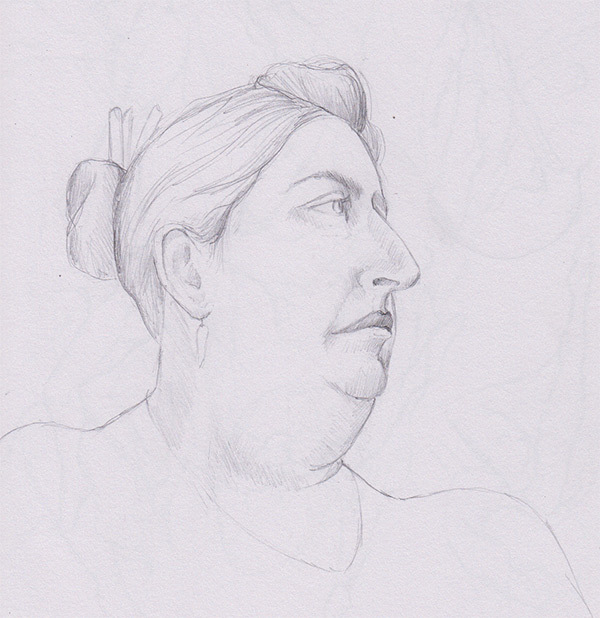 She has such a wonderful profile and I always try to find a spot to her side so I can draw her nose. Plus she’s a fabulous model, always spot on with the poses. 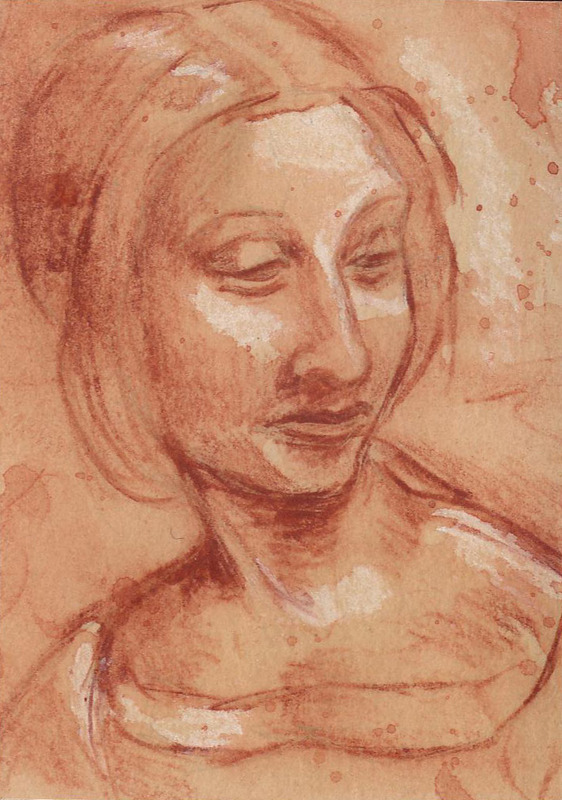 She reminds me of a master drawing (the one at right is from way back, an ATC in watercolor). I don’t know if I’ve ever posted this before, but I’m a ridiculously huge Dragon Age fan (and Mass Effect too of course!). Dragon Age Inquisition is out soon and this is my favorite new companion, Blackwall. I had to draw him. Hunky grey warden who likes beer and swords? I’m all in! Sold. I had to draw Blackwall loving his beer. Here’s Daisy, from the comic I’ve been working on (forever). I was trying out a grittier and darker style and think I’ll go with this. I scanned the inks on Bristol board and then colored in Photoshop. This is the SFW version. The NSFW version is on my Tumblr. It’s been a few weeks since I’ve had a post up but I have been busy making art, I just couldn’t show much of it since it was being sent out as secret gifts to art friends. Whew! It’s over and I can share! Below are a couple of canvases done in acrylic, Jack from The Shining and The Dude from The Big Lebowski. So much fun making these and I seriously love The Big Lebowski, one of my fave movies of all time. I also made tons of ATCs and other little bits. Here are a few in marker and ink. I also made lots of life drawings but the past couple of weeks, I’ve been turning them into silly doodles rather than proper figure drawings. We had a lovely, curvy model the other week and she become a beach beauty with polka dot bikini and swirly curled hair. The wonderful model we had this week became a king and voodoo master since voodoo was on the brain. The bottom left sketch with men holding their dolls is for a voodoo themed ATC swap. I just sketched out some silly ideas. Happy Friday! A while ago, I did some lighting and action pose paint sketches and they were such great exercises. I thought I’d bring back the ide a as a practice exercise a couple of times a week for an hour or so. I didn’t spend long of these ones above, probably about 20 minutes each or so though probably longer on the dancing duo. And by the way, I did do a movie still! But it’s really ugly. I’ll leave it hidden. Here are a couple of ice cream licker ATCs for the Art-A-Thon that’s happening over at illustratedATCs.com this weekend. These are watercolor and ink. I think the guy in the red shirt has encountered sour lime ice cream judging by his expression or maybe this is about 1 second pre-brain freeze. We’ve all been there. I had made a few coloring books a while ago but I’ve now made PDF versions for my Etsy store. I printed a few off and was coloring them to get a few Etsy photos and it was a lot of fun. Coloring is probably the best part of the artwork for me. It seems like it can be more work to get the sketch done and looking the way you want it, then the lineart is just sort of boring but coloring, it’s easy! All of the hardwork is done and you can just fill in areas between the lines. Here are a couple of the images from my Day of the Dead book and The Ladies (adult colouring). Back in the summer, I was going to paint a whole bunch of movie stills with different lighting and action poses as art practice. You know those “I’m going to totally practice my art” speeches we all give to ourselves monthly? Well, I got as far as Iron Man (definitely not finished) and some other movie with a female lead (I can’t even remember) and then promptly got too busy or too distracted by shiny new paint to do any others. I still have my directory of movie stills and I am determined use them for painting practice until I’ve gone through all of them. Maybe I should make it a PPF thing to do one per week. Maybe this goal will stick. I know this looks like another “I’m going to totally practice my art” speeches but pretend you didn’t notice that. I’ve been missing in action for a couple of weeks with good intentions. I had been trying to aim for an art heavy schedule to get new items in my store and lots of fresh new art to sell and then BAM! Flu! Today is day six of a really evil virus. In honour of laying in bed whimpering like a baby for most of the past week, I made this hideous little vomit fairy tonight. He’s not very friendly and I’m looking forward to kicking his smarmy face out of my house. On the bright side, I did manage to catch up on a lot of sleep. Yay? Below are a few life drawings from a couple of recent sessions earlier this month. Still digging the Staedtler ball point pen a lot. So smoooooth! No correcting mistakes though and I have to admit that I miss my gummy eraser. I have a bunch of mixed media canvas pieces on the go, though they didn’t see much action this week. I should have some new stuff to post for next week though. It’s been a fun change up from digital illustrations.